In the past I’ve reported on both digital and personal audio at RMAF in one report. 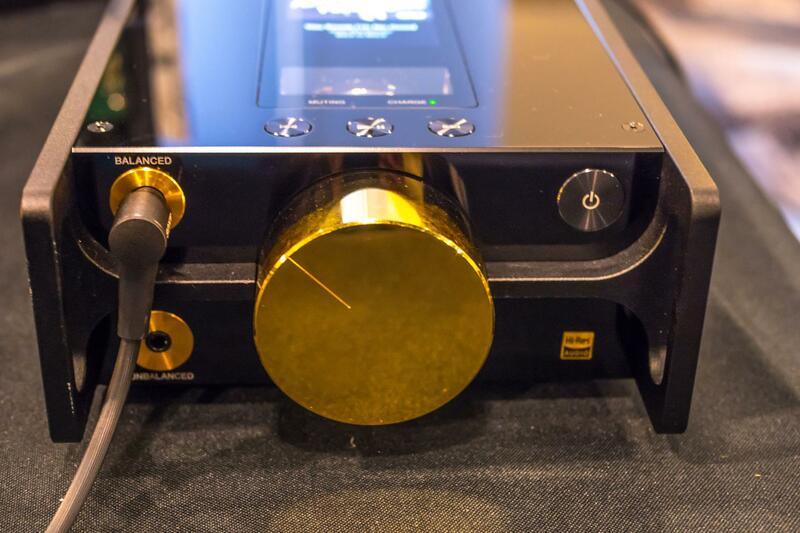 But as RMAF and CANJAM have continued to expand, so has The Absolute Sound’s coverage. Now Chris Martens of UHG will take over personal and portable audio, and I will concentrate on newest digital offerings. As usual, I found an ample supply of new digital components to explore, far more than I could include in one show report. The hardest part of this job is deciding which components to include in the report and which don’t manage to make the final cut. Winnowing down from all the dazzling possibilities to the ones included in the final draft is not done without a considerable amount of thought and angst. Here’s what that stood out for me this year. Instead of putting out only one new digital playback component, Cary Audio has rolled out two network-capable playback devices, the DMS-550 ($5495) and DMS-600 ($6995). They both use a new, second-generation MQA decoder and have filters designed for 768kHz playback via MQA. Potential playback sources include streaming via Tidal, v-Tuner, Spotify, and other services, in addition to SD cards, aptX Bluetooth, USB, AES/EBU, SPDIF coaxial, and optical connections. The DMS-550 also has a newly developed, pure Class A headphone amplifier and uses the AKM 4493EQ Velvet Sound DAC chips. While the DMS-600 does not contain a headphone amp, it ups its game with the new AKM4497EQ Verita DAC chips, aptX HD Bluetooth capabilities, plus Bluetooth output so you can stream to other BT playback devices; it is also Roon-ready. No matter what the original sample rate of the MQA file, the DMS-600’s MQA decoder will extrapolate the file to either a 705.6 or 768kHz sampling rate. In terms of sampling rates, “onward and upward” seems to have become Cary’s forte. Continuing the “two introductions is better than one” theme, MSB Technology unveiled two pocketbook-friendly DACs. MSB’s new Discrete DAC (base price $9950) represents a true ladder-style design, as do all MSB DACs. It also offers the option of adding a second, additional power supply ($1495). The Discrete’s physical architecture is modular, so you can install a Quad-Rate DSD and MQA input module ($1500), or Renderer input module ($1995), or a second optical and coaxial input module ($990), in addition to three more options offered. 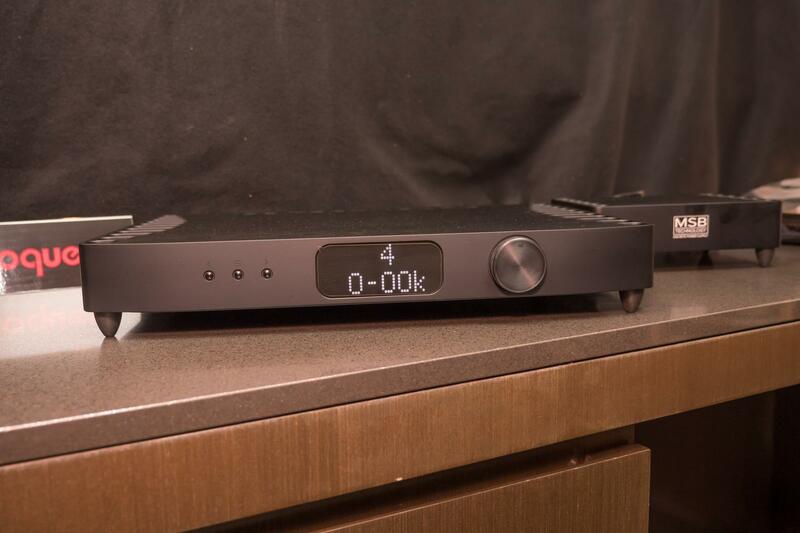 MSB’s second DAC, the Premier DAC ($19,500), is also a modular design and uses the same parts-quality and technologies as the company’s flagship Select DAC.Available in either silver or black finish, the Premier comes equipped with MSB’s optical/coaxial input module, an output module, a Premier clock, MSB remote, and a discrete outboard power supply. You can add MSB’s powerbase power supply ($7500 to $8950) or a Femto 93 clock ($4950), as well as seven other user-interchangeable modules. 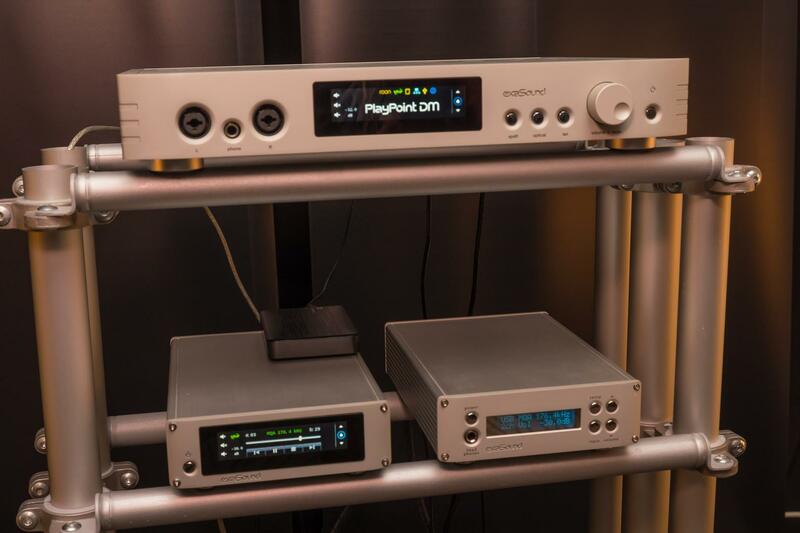 exaSound Audio Design was also doing the double-intro thing with the exaSound PlayPoint DM DAC and network server ($14,000) and e32 Mark II DAC ($2499). Based around two ESS9028 PRO DAC chips, the PlayPoint's fully balanced dual mono design features exaSound’s “galvanicInfinity” galvanic isolation technique. It also utilizes exaSound’s FemtoMaster 82-femtosecond master clock. With both balanced and unbalanced line-level and headphone outputs, the PlayPoint can serve as a digital hub for a full-featured audio system. The latest version of the e32, the Mark II as mentioned above, is also a true balanced design. Based around the ES9028Pro monolithic DAC with “hyperstream” technology, the e32 Mark II supports MQA and offers USB, coaxial, and TosLink inputs. Like the PlayPoint, the e32 uses a femtosecond masterclock and complete galvanic isolation. The e32 also has 11 linear power filter stages, and both balanced and unbalanced line-level analog outputs, and comes standard with exaSound’s Teddy 12/2 external power supply. 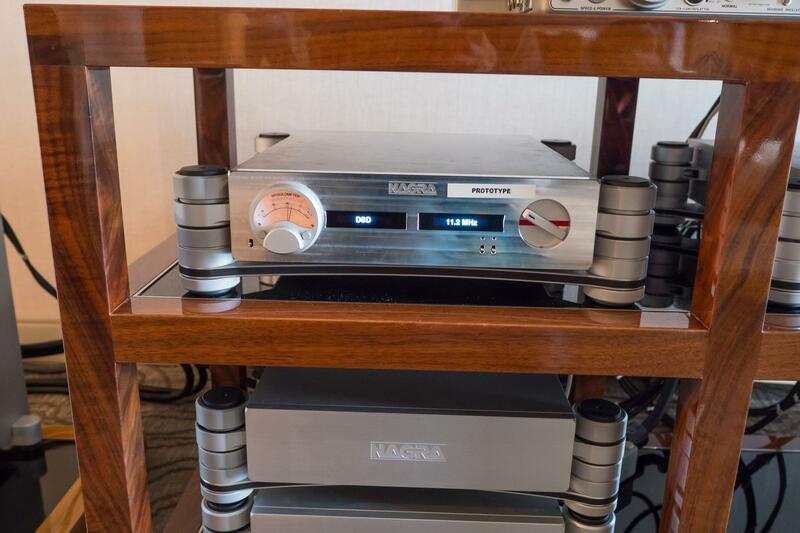 Nagra unveiled its latest thing of beauty, the HD DAC X ($65,000). With a separate power supply that features ultra-fast silicon carbide rectifier diodes, ultra-low-noise voltage regulators, and a virtual battery system made up of three times as many supercaps as the Nagra HD Preamplifier, the HD DAC X ranks as an impressive feat of engineering. 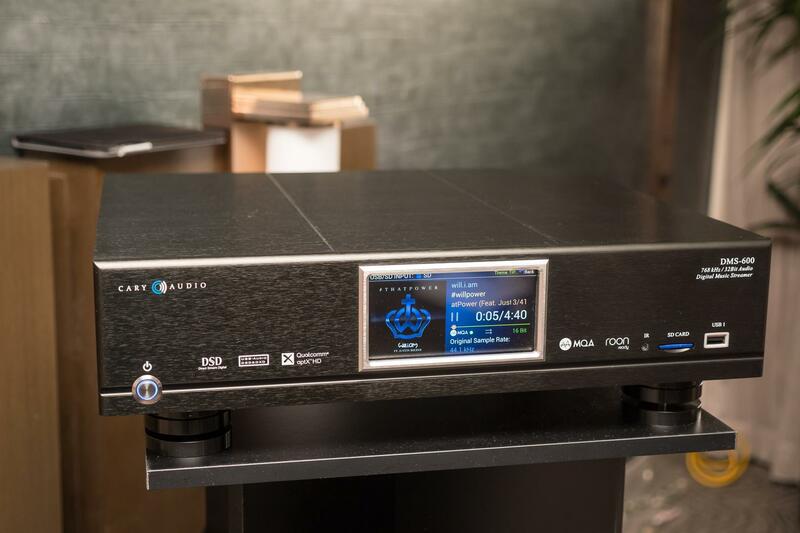 With 37 regulated power supplies, the HD DAC X includes AES/EBU and SPDIF inputs as well as the new Nagra Link single-mode ST-1 optical input, which uses the Andreas Koch P-Link protocol. The USB input, designed around an 8-core X-MOS chip, is also from Andreas Koch. Sony had two new U.S. premieres in the company’s CANJAM booth. The Sony DMP-Z1 ($8500) represents an entirely new product category for Sony: a state-of-the-art portable desktop headphone monitoring system/player. The emphasis here is on its intended use on a desktop, not as a portable in your pocket. The only outputs are for headphones, so it’s not a DAC/Pre. It has seven different batteries that supply power to the various sub-sections of the unit. Even its shape is unique—the chassis is shaped like a three-dimensional letter H, with the analog and digital sections separated with the former above and the latter below. Like the Sony TA- ZH1ES, the DMP-Z1 can perform a variety of upsampling and format conversions for playback. Instead of a “standard” XLR balanced output, Sony uses the new 4.4mm balanced connection. The sound, coming via the Sony MDR-Z1R full-sized headphones, was lush yet detailed. I didn’t want to stop listening. Schitt Audio ranks as one of my favorite market-disruptors. 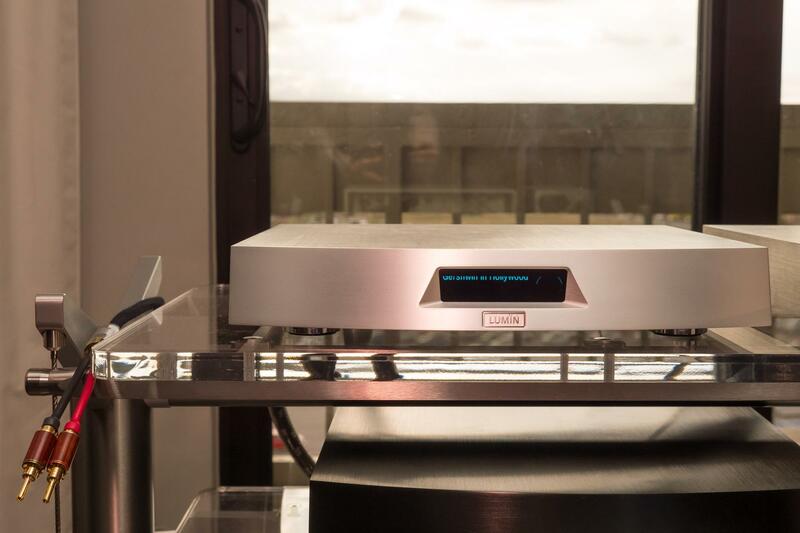 At this year’s RMAF, Schiit demo’d its latest $99 wonder, the Modi 3 DAC (pictured above). It supports PCM up to 192/24 and comes with USB, TosLink, and coaxial SPDIF inputs, and one pair of single-ended RCA outputs. 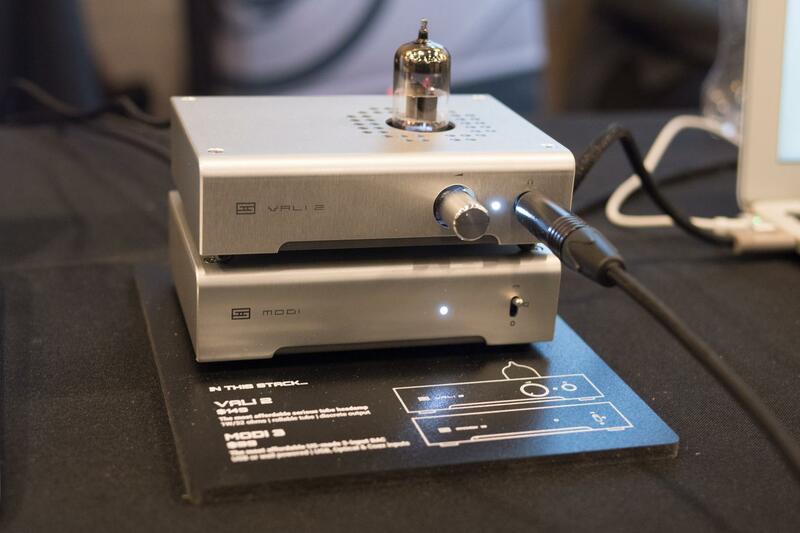 I listened to it coupled to the Vali 2 tube hybrid headphone amplifier ($149), as pictured above. If my beat for this show had been headphones, I would have nominated it as Best Sound for the Money. 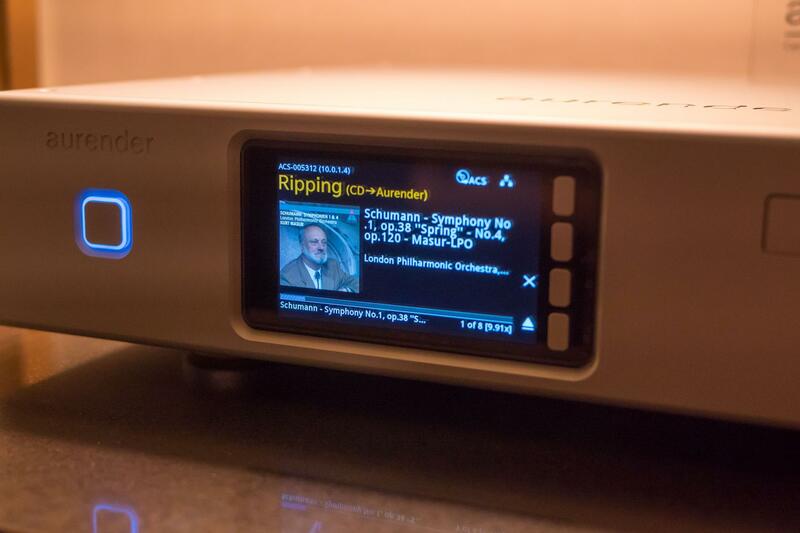 Aurender introduced its new ACS10 ($5600 to $7500), a caching music server and streamer, CD-ripper, HDD storage device, and a library manager all in one box. The ACS10 liberates a digital music library from reliance on a computer. Among its copious list of features are a full-linear power supply for audio and a “super-capacitor” uninterruptible power supply (UPS) for stabilizing the ACS10 in the event of an abrupt power-outage situation. Its four-inch display is a full-color IPS LCD. The ACS10 supports PCM up to 786/32 and DSD up to 256 via DOP and 512 natively. The Aurender even supports USB 3.0 via a rear port. Lumin had one world premiere and one North American premiere, the U1 and X1, respectively. The Lumin U1 mini ($2000) is a transport that according to Lumin, “Combines the best of Lumin’s U1 and D2 devices.” It supports DSD256 and PCM 384/24 utilizing a quad native clock system. With its low-noise shielded switching power supply it supports four types of digital audio output options: USB, BNC, coaxial SPDIF, and TosLink so it should be able to work with any DAC. Lumin’s other offering was the its new flagship X1 network music player ($13,990), pictured above, that uses a pair of ES9038Pro DACs and can support PCM to 768/32 and DSD512. Its power supply section was redesigned so that it is isolated in the single-billet, CNC-machined chassis. The X1 supports Roon, MQA, Tidal, Qobuz, and other streaming services. 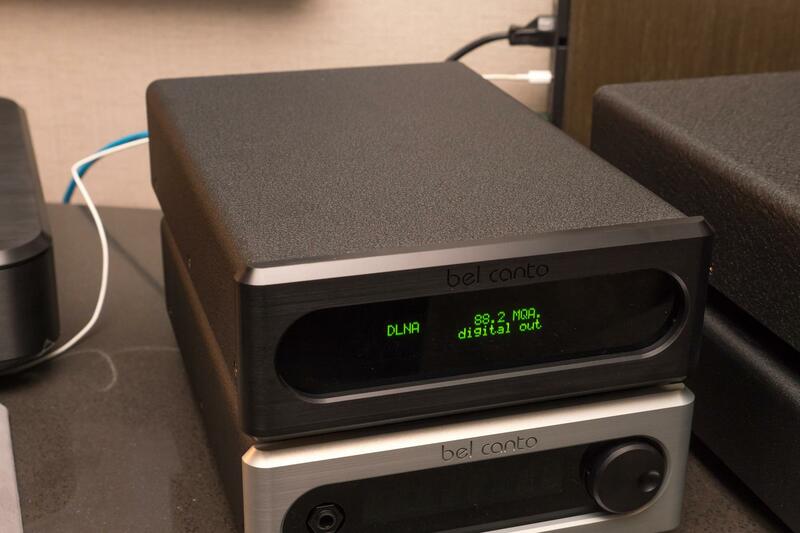 Bel Canto now offers a new streaming option via its e.One Stream ($1595). It offers both a line-level analog output as well as AES/EBU, coaxial SPDIF, and Toslink digital outputs. Discoverable by any UPnP-aware device, it is also a Roon-ready end-point and has provisions for attaching an external FAT32 hard drive. Bel Canto has even developed its own App for IOS called “Bel Canto Seek” that allows iPhone control of the e.One Stream. IFI, a company that never lets any grass grow beneath its feet, showed the xCAN ($299), a new mobile power amplifier with aptX and ACC Bluetooth capability that replaces the maker’s iCAN SE and iCAN models. With both balanced and unbalanced analog outputs, its dual-mono output circuitry draws inspiration from the Pro iCan. It includes IFI’s 3D+ Matrix and new XBASS II options which further increase its sonic flexibility. And it fits into your pocket. By now you might have heard that next year RMAF is shifting its dates forward to September andmoving to new venue at a dedicated convention hotel that’s currently in the final stages of construction by Gaylord Entertainment and Marriott. Ray Kimber visited the site before RMAF and showed me pics of the venue. It’s big, with lots of good-sized rooms—in fact, it looks so enormous that it could have enough floor space to host RMAF, AXPONA, and CAF all at the same time! I had a long conversation during the show with Thorsten Loesch of Abbington Musical Research and IFI. He told me a fascinating story about confirmation bias. That’s when you are so sure of something that even strong evidence to the contrary will not persuade you to change your mind. Thorsten put together a blind ABX testing where he told participants it was a comparison of two power cables. But when he went behind the curtains, ostensibly to change the power cable, what he actually did was switch the speaker cables on one channel, so the system was playing out of phase. Thorsten had three different types of audiophiles take his test: subjectivists, objectivists, and those who were neither. The subjectivists and neutral listeners heard the effects of the system being thrown out of phase. The objectivists heard no differences. It was a robust test with clearly correlated results. And how noticeable is having one speaker’s channel out of phase with the other? Ten years ago, at CES I entered a room with an “All Digital System” that had all the DACs and electronics in the loudspeakers. I listened for about ten seconds, then I turned to the gentleman who was giving the presentation and told him, “One of your channels is out of phase with the other.” He told me that was impossible since all the connections were hard-wired. I thanked him and left. A day later he caught me in the hall and explained that indeed one channel had been mis-wired out of phase. The fact that the objectivists in Thorsten’s test were the ones who were so set in their opinions that it blinded them to the aural facts in front of their ears is a delicious irony. Why? Because those audiophiles who embrace ABX testing with the most fervor are those who believe most strongly in effects of expectation bias, which is why sighted testing is, in their eyes, flawed. Thorsten’s test indicates a strong tendency for objectivists to listen with closed ears whether the test is blind or sighted, which isn’t very objective, is it? The combination of Joseph Audio Perspective loudspeakers ($12,999/pr. ), Doshi Audio Line v3.0 preamplifier and tape head preamp ($17,995), Doshi Stereo Amplifier ($19,995), Aurender A-10 streamer ($5500), Cardas Clear Network Cat-7 ($580) cable, Cardas Clear Beyond Power XL ($2480US) power cord, and an HRS SXR-1921-3V rack system ($5225) delivered uncolored, highly resolved sonics. The system in the Crestone Peak Room had the Sonus Faber Aida 2 loudspeakers ($130,000/pr. ), Audio Research 160M mono power amplifiers ($30,000/pr.) and S Reference 9 CD9 player/DAC ($13,000), Reference 6 linestage ($14,000), HSR SXR equipment stands, and Kubala-Sosna cabling. Elac’s new Navis ARB-51 powered loudspeakers ($1999/pr. ), Alchemy Series DDP-2 preamplifier/DAC/music server ($2499), Discovery DS-S101-G music server ($1099), Elac LS-80 speaker stands ($399/pr. ), and 512 Engineering Marutani consulting interconnects (Price TBA). Big boxes are on their way out. Gear is becoming less obtrusive. Everybody wants to share their life with music, but more people don’t want to surrender large amounts of real estate to large shiny metal boxes. For me that would be a dead heat between the new Sony DMP-Z1 desktop music player ($8500) and the Kii Audio Three BXT system ($46,995).